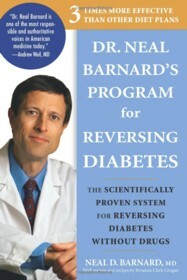 Dr. Neal Barnard's Program for Reversing Diabetes is a book in the Medical genre written by Neal Barnard. The book was published by Rodale Books on 2006-12-26 and contains 288 pages. The book has an ISBN number of 978-1594865282. Our users found the overall impression of this book to be Educational. Dr. Barnard's book looks at his scientifically proven system to reverse diabetes. His research has shown that type 2 diabetes can be successfully reversed by getting your blood sugar levels under control. Additionally, Dr. Barnard's program has been shown to improve blood sugar levels nearly three times more effectively than a standard diet all without the use of drugs. In some cases his system can reduce or eliminate the drugs that diabetics are currently taking. While all this makes it sound as though he has discovered some ingenious method to reverse diabetes, his diet is actually quite simple and can be summed up in one word - vegan. This means that the entire diet is composed of vegetables - no dairy products, no meat, no eggs, no fish etc.. The book is very easy to follow and Dr. Barnard gets right to the point with well explained descriptions of the disease and what can be done to help. I am overweight and borderline diabetic. I purchased this book with the hope that I would be able to lose the excess weight and better control my blood sugar levels and hopefully avoid the problem progressing further. I initially found it difficult to give up eating meat, but after trying some of the "healthy" recipes found in this book I don't miss it one bit. The recipes are well thought out and I found the majority of them to be very tasty. Following his guidelines "closely" for one month (I haven't yet been able to give up butter) I have been able to lose 10 pounds and I feel much better overall. I would recommend this book to those looking to reverse or reduce the effects of their diabetes and to those who just want to live a healthier lifestyle.